Keter’s Borneo wicker resin storage box equips any home with an effective solution to harbor away a whole range of accessories. Available in either espresso-brown or grey shade, their weather-resistant make-up is attractively molded, producing a smart addition to any indoor/outdoor space. We’ve become quite attached to the low maintenance benefits and easy clean advantage these resin style of storage solutions deliver. Evolving through new developments of resin designs, delivering durable composite mixes & methods of molding procedures, there’s some stylish weatherproof displays entering the market nowadays furnished with plenty of additional features. Acquiring a low maintenance outdoor storage solution like the composition this Borneo is manufactured with sure beats the headaches outdoor wooden structures entail due to their inability to survive damp conditions. Being unsusceptible to weather deterioration, Borneo’s durable surface can be cleaned in a snap, capturing waves of interest from those wishing to replace hassles with convenience. Indoors, the Borneo caters for an abundance of storage potential. Whether it’s sat in a homes entrance occupying outdoor wear and boots, the ability for sitting on the box presents no problems due to its sturdy construction whilst accommodating kids toys is another popular service suited by their small height & child-friendly pistons, enabling the delivery of an uncluttered the space in a moment’s notice. Providing a stylish adornment presented in a conservatory serving to squirrel away games and necessities the Borneo is small enough to sit perfectly on a balcony or located within a home’s restricted spaces helping to maintain a clean environment whilst doubling up to serve as a two person seat. Outdoors the stylistic rattan textured appearance provides the accents to enhance any outdoor space like situated on a small backyard holding gardening tools and plant supplies or a barbecue area accommodating grilling utensils however probably the most popular service represents storing outdoor seating cushions & patio accessories whilst delivering bench seating. 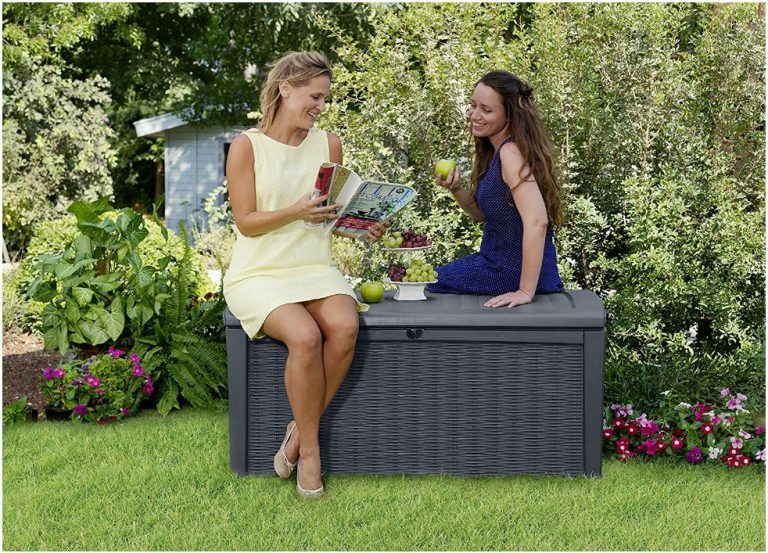 The Borneo exhibits either a grey or espresso-brown shade displayed in rattan styling however the beauty lies within the polypropylene resin manufacture and the way the box is designed weatherproof, delivering a safe haven for storage. 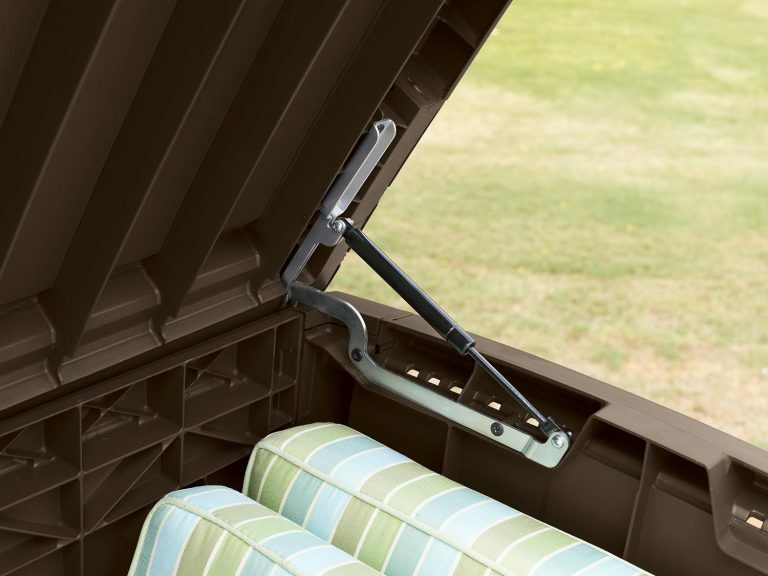 Inside a dry and ventilated environment provides an ideal atmosphere for storing patio furniture cushions. Inside the box, you’re not presented with the modern styling Borneo’s outer-surface exhibits, rather a plethora of resin ridges critical for delivering sturdiness and stability to the construction. Unlike their wooden counterparts, polypropylene is resistant to weather decay. The inherent problem wood represents covering a lid this expanse regards the frequent upkeep duties requiring regular re-varnishing to preserve, the same applies to roofing-felt’s rapid disintegration problems & inability to survive damp conditions. Polypropylene on the other hand is immune from weather attack, requiring no wood-stain, paint nor varnish nurturing projects to conserve. Borneo’s only maintenance involves the small task of a wipe-down when dirty to replenish their shine, many just lightly spay-hose the surface down once in a while. Hard to shift dirt is best removed with a soft brush dipped in warm water & mild detergent as this gets into the rattan crevices more easily. Although the sleek wood-like wicker design complements any outdoor space with modern eye-appeal the composition is robust enough to seat two people. Whether additional seating is on the agenda or a place to sit in a homes entrance whilst tying shoelaces, the Borneo caters for such services. There’s some wondrous feedback received from Keter products regarding their resistance to fading and cracking when subject to the sun. Technical advances have now evolved to toughen and UV stabilise the polypropylene ensuring resistance to splitting whilst withstanding inherent colour-fade problems associated with unprotected plastic when sunburn attacks. Polypropylene delivers durability & stylish advantages, there’s no doubt however it’s also environmentally friendly, being 100% recyclable. The lid occupies an automatic opening mechanism assisted by pistons delivering gas pressured entry into the store-box whilst providing support in keeping the lid ajar, aiding access & simplifying the process, especially when hands are full. Pistons reinforce support to Borneo’s hefty lid weight by their gas pressure held within, creating a child friendly closure preventing the lid’s full weight slamming shut on fingers, making this an ideal indoor/outdoor storage box for kids toys. The near flat lid design is something we searched for & use daily when the weather’s okay to serve as additional table space, beneficial for drinks and alfresco dining sat on a patio plus the advantages of sturdy bench seating delivers triple services. 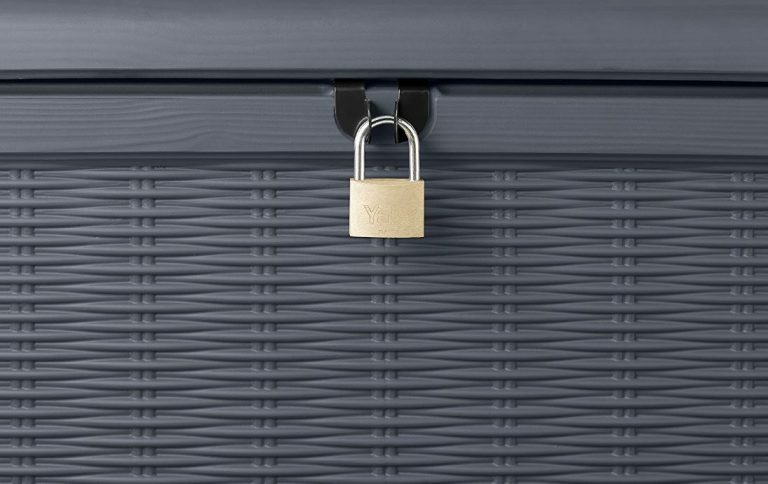 Security-wise, the lid is lockable by means of a padlock clasp that adjoins the lid to the body, padlock has to be purchased separately. One thing to note regarding many deck boxes: If the lid is wet it’s a good idea to wipe away any rainwater before opening the box, many designs can be subject to water entering inside upon opening, best practice to undertake when accommodating cushions. This Borneo wicker style box is described as having a 416 L or 110 G capacity which means diddly squat to most of us regarding accommodation room. 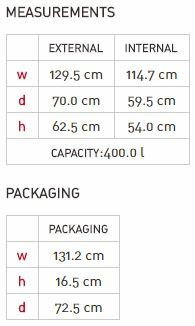 Here’s a screenshot of the exterior and internal dimensions presented below to measure and compare with storage and desired deck box location. Assembling the Borneo takes approximately 20 minutes-ish, construction couldn’t get anymore straightforward, all the panels making up the floor and sides interlock with each other and snap into place. 10 screws are supplied for fastening the security clasp and pistons to the box & lid and two people are required to ease the attachment of the lid, one supporting whilst the other secures with screws. Voila-done! 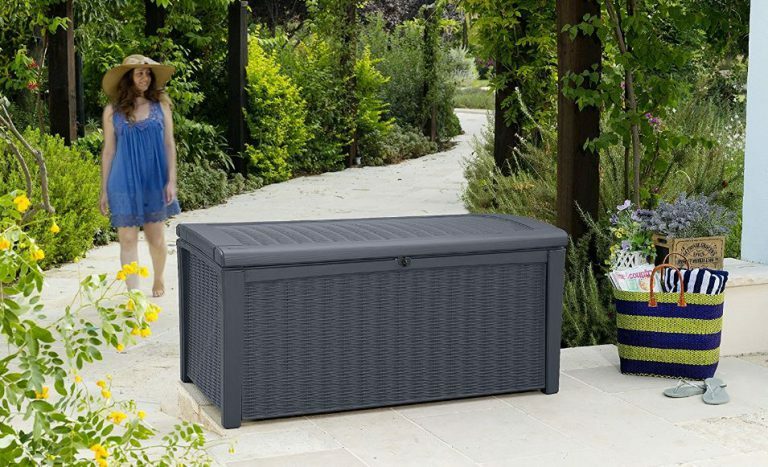 Competition-wise in a wicker style there’s the larger 135 Gallon capacity Sumatra Deck Box in anthracite grey or mocha brown shade, then there’s the hugely popular 99 Gallon capacity Suncast Deck Box, not as suited for seating nor flat lid services and lacking a piston operated lid mechanism however it’s ultra stylish. 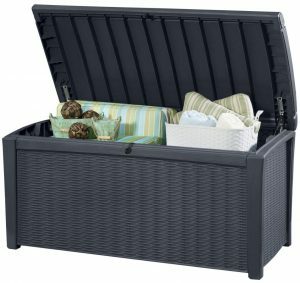 Compare the abundance of deck boxes below, consisting of various styles and sizes with accents to complement any surroundings. In very little time, assembly of the Borneo can be accomplished and situated attractively complementing any surroundings with the benefits of having a weather-resistant surface that’s effortless to maintain a spotless appearance whilst protecting storage, keeping it dry and ventilated inside. Whether intentions are for pool storage, harboring patio accessories & cushions, a stylish addition for a balcony with seating potential or stood indoors attractively enhancing a conservatory or entrance-way whilst serving the purpose for the quickest of tidy-ups, storage potential seams unlimited. Trumpeting out the advantages written above whilst accompanying a 2 year warranty with excellent feedback received through reviews, the Borneo regards another popular weatherproof storage solution from Keter. Thanks for reading about Keter’s Borneo wicker resin storage box. If you have any related deck box queries, please share in the comment section below. Always happy to help. Please share the Borneo with your social friends. Thank you! I absolutely loved the reading! I’ve made a storage box with some woods that were thrown in my garage:). The box has been exposed to water and snow, and today it looks really in bad shape. So I need a new brand storage box that can hold a lot of gear inside. This one seems to be of high quality. I love the Gray box. I just would like to know if it’s waterproof? Thanks for calling in to read about Keter’s Borneo wicker resin storage box, glad you enjoyed the review. The trouble with wood, especially in a deck box style is their inability to survive the weather elements & damp conditions, leading to their structural demise through rot & decay, the reason wood deck boxes are seldom seen nowadays. Borneo’s polypropylene composition on the other-hand is immune from weather decay, the only maintenance required regards a swift wash down when the grime appears. 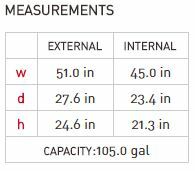 The internal storage capacity of the Borneo is 110 Gallons, quite a large box that can accommodate a whole plethora of gear. 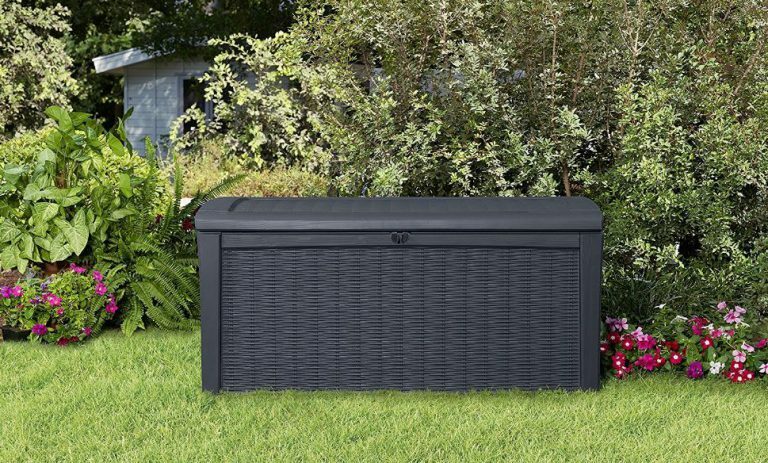 Inspect alternative deck boxes if slightly larger dimensions are required, there’s a whole variety of different styles to choose from. The strange thing about deck boxes, whether a wood or resin composition is chosen is non are waterproof. Polypropylene make-up is waterproof, however their click-into-place assembly procedure has faint gaps within their interlocking mechanisms, meaning they will leak if fully immersed. They are however all designed weatherproof, to repel rainwater falling down upon them and maintain a dry internal environment. 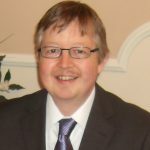 Simon,the post is very well put together with good color and pictures as well as very good wording in the paragraphs. The benefits of having a weather-resistant surface thatâ€™s effortless to maintain a spotless appearance whilst protecting storage keeping it dry and ventilated inside can be priceless especially if you have children around. 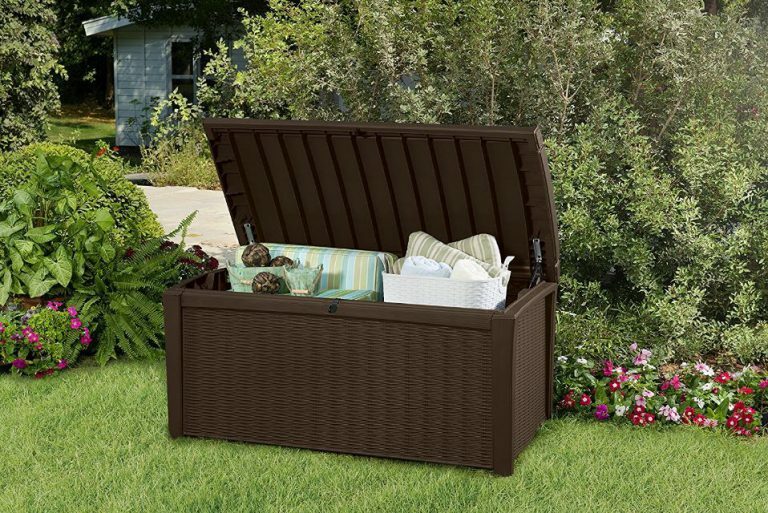 Thanks for calling in and reading about Keter’s wicker resin storage box. Yeah, low maintenance constructions manufactured from resin cut out all future headaches regarding upkeep work, resisting rust, rot and decay whilst cleaning the facade relates to just the simple requirement of a wash down once the dirt starts to appear. Child friendly pistons incorporated into this wicker box provide the benefits by supporting most of the lid’s weight, resisting the lid slamming shut and trapping fingers whilst aiding the opening as the gas pressure takes over lifting as you start to enter. 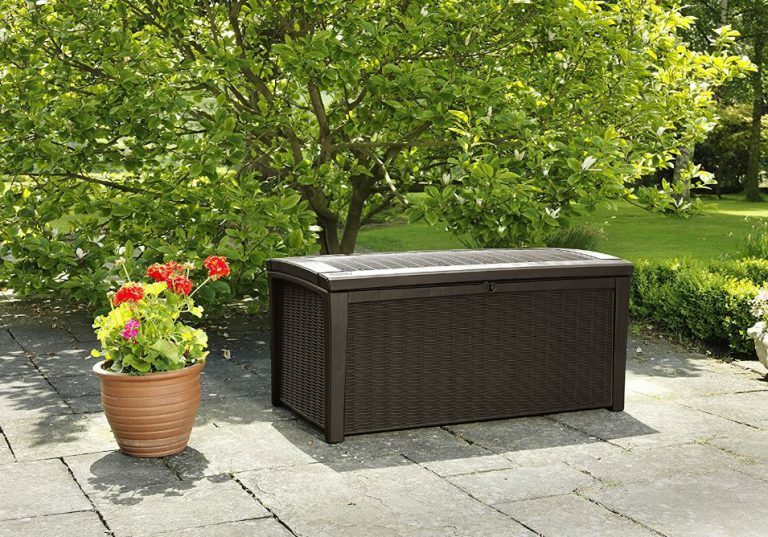 The features built into Keter’s wicker garden box provide an effortless duty to clear the space at a moments notice, making it an ideal storage solution for kids toys scattering the garden. 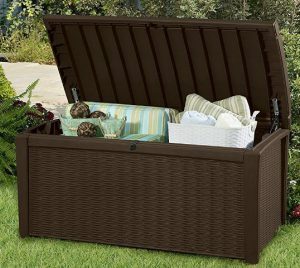 The Borneo Storage Box in Espresso Brown is my favorite, and I love the fact that I can use this on my sun-porch as well as outdoors in my backyard. It is the perfect size, actually, to store my winter coats and scarves! I can also use it as a coffee table. I am really impressed with the material which seems to be much easier to maintain than real wicker. This looks like wicker but without the difficulty of dusting and cleaning. The automatic opening mechanism, combined with the storage padlock really kicks this up a notch over the competitors. Definitely on my list of purchases, and wondering if it comes in any other colors? 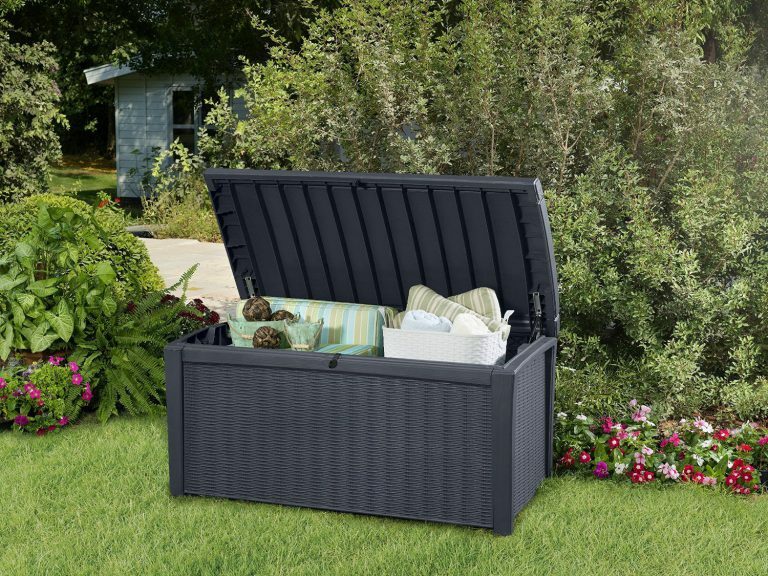 I know quite a few people who locate these deck boxes indoors, especially in the entrance to their home for placing outdoor gear like boots and shoes etc inside, their attractive stance and seating ability combined with storage potential captures interest. Also to hide toys, work tools and sporting equipment indoors is a growing popular idea. We decided to choose one consisting of a flat lid for table services on our patio, its been a great decision on our behalf. To occupy furniture seating covers whilst serving as a table plus seating ability when guests visit combines 3 useful services in one, great for a patio. Quite a few deck boxes are now installing the automatic opening mechanism for the lid. Gas shock pistons take over opening once you start to lift the lid, they keep the lid ajar when full opened easing storage duties whilst preventing the full weight of the lid slamming shut which is hugely beneficial preventing fingers getting trapped. The Borneo just comes in grey and brown however if you select Storage Deck Boxes in the top menu there are plenty of alternative coloured deck boxes in different sizes, all receiving fab reviews, take a look. This Borneo Storage Box is very luxurious. I like it. I do have a question. In the event I place something on it or sit on it. So how much weight can this box withstand? Also in case the kids want to beat it up for no apparent reason, how tough is this box? 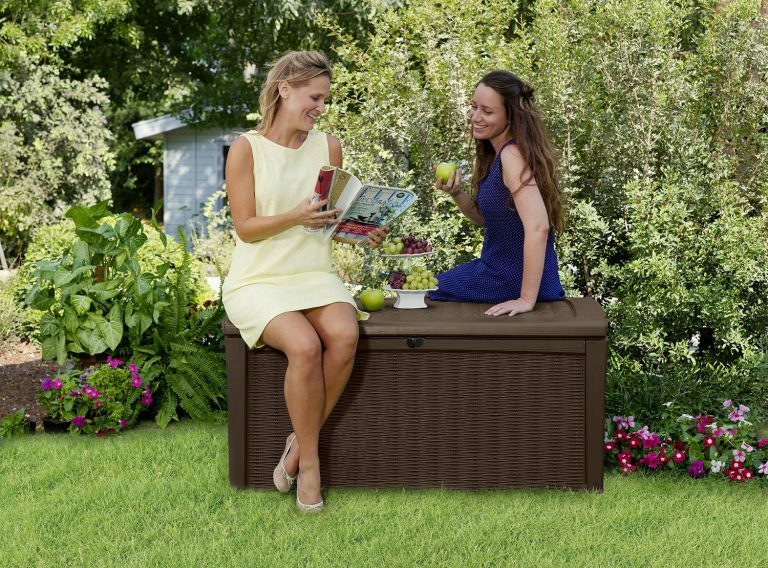 Thanks for stopping by and reading about Keter’s Borneo Storage Box. Yeah, they look smart and will seat 2 people comfortably, their design complements any outdoor or indoor space. This type of box is so versatile to what people use them for. 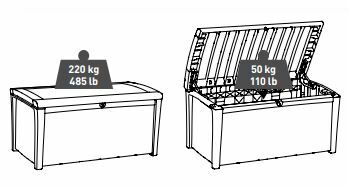 This box will hold approximately 50kg / 110lb of inside storage weight however the lid is able to hold a weight of 220kg / 485lb, so as you can probably imagine it will seat 2 adults comfortably.